MXL is a EC co-funded project, whose main goal is to enhance the safety of osteoarthritis patients undergoing surgery using computational modelling from clinically available x-rays, so to minimize the risk of overload and instability for optimized function and joint longevity. The project has recently closed, bringing some outstanding outcome. A short interview with the Coordinator, Markus Heller - University of Southampton, will talk us through the project. Osteoarthritisis a disabling disease leading to the destruction of joints, chronic pain and restricted mobility. It affects the joints of 40% or more of the population over 60, resulting in a socioeconomic burden of €7b per year in Germany alone. However, we also see an increasing number of younger adults affected by the disease, where often sports related injuries result in the onset of of joint degeneration already much earlier in life. Joint surgery is then performed to either minimize the risk of early degeneration of the native joint, or to replace a fully degenerated joint with artificial components. Here, well over 1,000,000 surgeries of the larger joints are performed annually in the EU. What are the key factors of success in joint surgery? Unfortunately at least 10% of reconstructions fail within 10 years of surgery, and a large fraction of native joints progresses to early osteoarthritis. The ensuing revision surgery is not only painful and stressful for the patient, but also costly for the health care providers. Just to give some numbers, a hip provision is estimated at over €80.000. Moreover, the rehabilitation period after such a revision operation is often prolonged and yet the functional outcome rarely matches the success of the initial replacement. A key factor for a successful replacement are the biomechanics of an artificial joint. Here, the performance of a replaced joint is defined by a complex interaction of individual anatomy, prosthesis design, sizing and placement. Today surgeons have to rely on their experience to best perform the operation and ensure long lasting function. There are currently no solutions to support their decision process by reliable and quantitative information on the expected joint mechanics and functional outcome. How can the MXL project improve the current state of art? 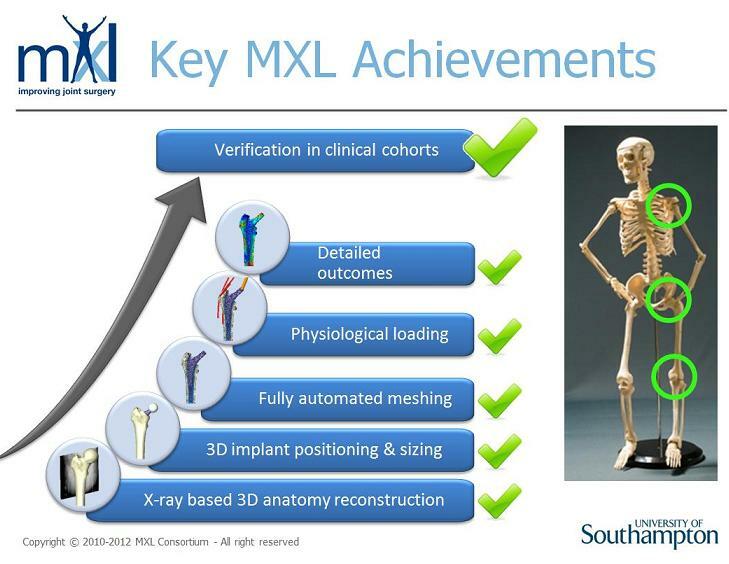 The MXL project aimed to ensure that the development of new implants and the planning of the joint replacement procedure are supported by quantitative data on those aspects of joint biomechanics that critically define the outcome of joint surgery and the performance of an artificial joint. In order to do so, MXL developed and validated sophisticated modelling technology that optimally utilized routinely available data from both the individual patient and the wider population. The ICT system will enable both cost effective prosthesis designs and support surgeon decision making to provide a safer route to optimal functional outcome of joint surgery, independent from the surgeon prior experience and training. The development of this unique software toolbox was the result of the great collaboration among the different project partners and the blending of different expertise. Which were the critical factors that enabled each of the partners to successfully contribute to the development process? We were indeed lucky to get together a distinguished consortium of leading partners from across Europe. The consortium included academic experts with biomechanical engineering, but also medical image processing and visualisation expertise and industrial partners, which provide innovative solutions to challenging problems, also supported by clinical opinion leaders. It was this unique combination that allowed us to not only develop novel technology, but also to verify the predictive capabilities of the framework in clinical cohorts for applications at the shoulder, hip and knee (See figure below). The success of the MXL team comes from the extraordinary dedication of each of the partners to live up to the challenge and not only engage in a truly collaborative effort to develop novel technology, but also jointly demonstrate its use and value. In that process the support provided by our advisory board certainly helped to remain focussed on the essential tasks but also opened quite a few doors which are critical for the dissemination and exploitation of our results and achievements. What are the strengths of this project? The MXL consortium firstly contributed considerably towards an understanding of the factors that critically define the mechanics and function of the large joints. This scientific contribution is evidenced in well over 20 peer-reviewed journal contributions already within the lifetime of the project. Here, papers such as those in the American Journal of Sports Medicine(1)and the Journal of Bone and Joint Surgery(2)are not only testament to the high quality and relevance of our research, but also demonstrate our success in advancing the field in respect to the surgical treatment of the early as well as end stages of OA. Whilst we focussed on maximising the use of routinely available clinical data, we also developed and verified new approaches to consider the individual dynamic function of a patient, which we found to have a profound effect not only for the mechanics of the knee and shoulder but also the hip joint. There are some outstanding technologies that were developed within MXL, including e.g. the award winning approach for the efficient projection and deformation of volumetric intensity models for accurate simulation of X-ray images (NVIDIA award Eurographics 2012). It is very encouraging to see that such successful developments were made possible by the talented young scientists in our team, who delivered stunning results throughout. Beyond the interactions within the MXL consortium itself, the 3rdVPH-NoE workshop held in Barcelona in 2012 was another critical tool to foster collaboration across projects and disciplines. This event allowed in-depth discussion of the successful approaches used in projects such as MySpine, VPHOP and MXL, and will certainly play a role in enabling these promising scientists to continue to develop their careers and make a positive contribution to transforming the practice of healthcare in Europe. However, I am particularly proud that we managed to integrate the various tools and components of the MXL workflow and demonstrate the ability to predict joint mechanics and predict failures in considerable sized clinical cohorts (See figure below). And we succeeded to deliver that proof for cemented as well as cementless hip stems, but also for total shoulder and knee replacements. This clinical demonstration of the predictive power of these tools will certainly be instrumental for the translation of the technology to implant development and clinical practice alike. How do you think the new tools will be adopted and used in the future? The technology developed within MXL has high commercial potential in the development of new implants, but also the verification of indications of existing devices. We already had significant interest from a range of industrial partners, which understand that this area (where experts are readily able to use and apply the tools as currently developed) is the one where an immediate benefit in terms of faster development of more robust and safe implants can be obtained. The clinical routine application of the tools in the planning of surgical procedures requires additional steps to obtain e.g. regulatory approval, but here larger centres such as the Southampton Orthopeadics Centre for Arthroplasty and Revision Surgery (SOCARS) will probably be the first to benefit, but also support the further development of market-ready applications. Figure:At the end of its 3 year funding period, MXL successfully verified all key components of the workflow to predict the clinical performance of total joint replacements (TJRs). The pictures shown above are exemplary images taken from processing a total hip replacement through the MXL pipeline. Verification of the modelling steps occurred at individual stages but also included the detailed verification of the prediction of TJR performance in larger cohorts of total hip and knee replacement patients against the comprehensive clinical data follow-up data.